Open Library is an online project intended to create "one web page for every book ever published". Created by Aaron Swartz, Brewster Kahle  among others, Open Library is a project of the non-profit Internet Archive and has been funded in part by a grant from the California State Library and the Kahle/Austin Foundation. It provides access to many public domain and out-of-print books, which can be read online. Its book information is collected from the Library of Congress, other libraries, and Amazon.com, as well as from user contributions through a Wiki-like interface. If books are available in digital form, a button labelled "Read" appears next to its catalog listing. Links to where books can be purchased or borrowed are also provided. Open Library claims to have 6 million authors and 20 million books (not works), and about one million public domain books available as digitized books. Tens of thousands of modern books were made available from four and then 150 libraries and publishers for ebook digital lending. Open Library began in 2006 with Aaron Swartz as the original engineer and leader of Open Library's technical team. The project was led by George Oates from April 2009 to December 2011. Oates was responsible for a complete site redesign during her tenure. The site was redesigned and relaunched in May 2010. Its codebase is on GitHub. The site uses Infobase, its own database framework based on PostgreSQL, and Infogami, its own Wiki engine written in Python. The source code to the site is published under the GNU Affero General Public License. The website was relaunched adding ADA compliance and offering over 1 million modern and older books to the print disabled in May 2010 using the DAISY Digital Talking Book. Under certain provisions of United States copyright law, libraries are sometimes able to reproduce copyrighted works in formats accessible to users with disabilities. ↑ "Openlibrary.org Site Info". Alexa Internet. Retrieved 2014-04-01. 1 2 "A library bigger than any building". BBC News. 2007-07-31. Retrieved 2010-07-06. 1 2 3 Grossman, Wendy M (2009-01-22). "Why you can't find a library book in your search engine". The Guardian. London. Retrieved 2010-07-06. ↑ "Aaron Swartz: howtoget". Aaronsw.jottit.com. Retrieved 2015-06-05. ↑ "About Us". Openlibrary.org. Retrieved 2015-06-26. ↑ Fowler, Geoffrey A. (2010-06-29). "Libraries Have a Novel Idea - WSJ". Online.wsj.com. Retrieved 2015-06-26. 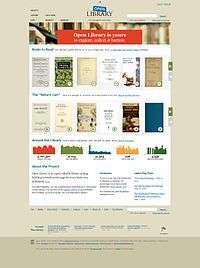 ↑ "Internet Archive Forums: In-Library eBook Lending Program Launched". Archive.org. 2011-02-22. Retrieved 2015-06-26. ↑ "George". Openlibrary.org. Retrieved 2015-06-26. ↑ Oates, George (2010-03-17). "Announcing the Open Library redesign « The Open Library Blog". Blog.openlibrary.org. Retrieved 2015-06-26. ↑ "internetarchive/openlibrary · GitHub". Github.com. Retrieved 2015-06-26. ↑ "About the Technology". Openlibrary.org. Retrieved 2015-06-26. ↑ "Developers / Licensing". Openlibrary.org. Retrieved 2015-06-26. ↑ "openlibrary/LICENSE at master · internetarchive/openlibrary · GitHub". Github.com. Retrieved 2015-06-26. ↑ "Project puts 1M books online for blind, dyslexic | UTSanDiego.com". Signonsandiego.com. 2010-05-05. Retrieved 2015-06-26. ↑ "Welcome to Daisy Books for the Print Disabled". Internet Archive. Retrieved 10 December 2012. ↑ "NLS Factsheets: Copyright Law Amendment, 1996: PL 104-197". Library of Congress NLS Factsheets. Library of Congress. ↑ Scheid, Maria. "Copyright and Accessibility". Copyright Corner. The Ohio State University Libraries.